I was curios about fan control problem on Dell laptops for some time. The thing is, that Dell on most of their laptops don't allow controlling fans via Embedded Controller (EC) as Notebook Fan Control utility do. The only way to control fans is over SMM. 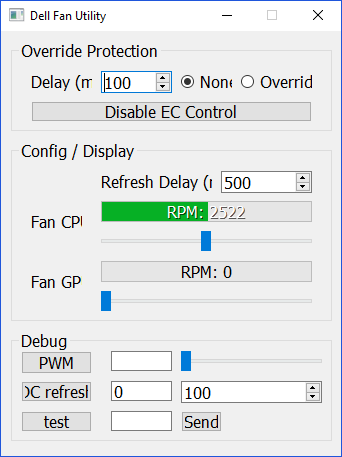 HWinfo64 and SpeedFan have such an option, but in most cases setting up custom fan speed resulting in fight between EC and the program - EC sets its own values for fan prior to program values. The only way to be able to control fans with software is to turn EC thermal management (tm) feature off. Back in times, on Dell Precision M6500 and older there was a keys combination that could bring up EC menu where you could turn thermal management off. But this menu was removed from newer laptops, so taking control over the fans was not an easy task. Lucky Linux users found out some time ago a method to disable EC tm via i8k driver and SMM commands and control the fans with i8kutils. After successfully setting testsigning mode you should reboot. !!!Warning!!! This method has been tested only on several machines. Use it on your own risk! Here is the GUI of the utility. Basically, it can monitor/set your fans speeds and disable EC control. The utility designed to run on Windows 10 x64 and x86 systems so it might not work on older versions of Windows. If you are accepting all the risks, click "Disable EC Control" button and try to adjust fan speeds within the app. If setting custom speeds works - my congrats, you've just taken control over the fans. Now, to make you life more sweet, you might willing to use something more powerful and flexible in terms of thermal control such as HWinfo64 or SpeedFan utilities. First one is good for novice users and is easier to setup. 2nd utility is more complex and if you gonna to give it a try - enable Dell laptop support in Options menu and restart the app. A bit later I'm going to upload some configurations for both utilities. Thank you for reading! Good luck and have fun! Aaron44126, Windsigh, Matt111 and 7 others like this. Gonna test it on M6800 during sunday. Does the bios reset also resets EC? Honestly, can't tell you anything about that right now, coz I'm not at home place and have tested this solution remotely. But Dev said, that complete shutdown then power on should work. I can't get testsigning mode enabled... for some reason it won't let me disable secure boot even though it says I disabled it in bios. Hey just wondering how I can get this to work? Ok so it seems to work through using fan control, the dell fan utility app itself doesn't seem to work with controlling the speeds though. Do you have any recommended settings to use with the m4600? Thank you so much for this tool I had Linux on my m4600 a couple of weeks back for my IT study, I knew there was a tool to make this all work within Linux but not windows I had been looking online for this fix for ages. I've had my m4600 since the start of 2016 and love this laptop!, so happy to find this tool!. 1 question though I can only do speeds of 0,2500,4900 nothing in between is that normal? seems to run great at 2500rpm on all the time, can this be adjusted to 3000rpm?. Also I read that link you sent I have bits and pieces of that thread before, my main question is can I run one of these 5100 amd cards on my m4600 with the IPS screen or is the cable and motherboard not going to let that happen and I'm stuck at with the 2000m? thanks! The way i got this to work was to run the following in admin command prompt Bcdedit.exe -set TESTSIGNING ON reboot run the fan utility as admin disable ec then close the program. Doing this will allow speed fan to take over will work through reboots but not shutdown. Make sure you have speed fan setup correctly to control your fans. You also may need to disable driver signing via advanced startup to get the driver to install on first run. Would be nice for the utility to save its configuration so one could make a scheduled task to run on login.